​Want to know more about our school? We encourage Parents and Students to stop by our school for a complimentary tour and more information about Registration and Tuition Assistance. 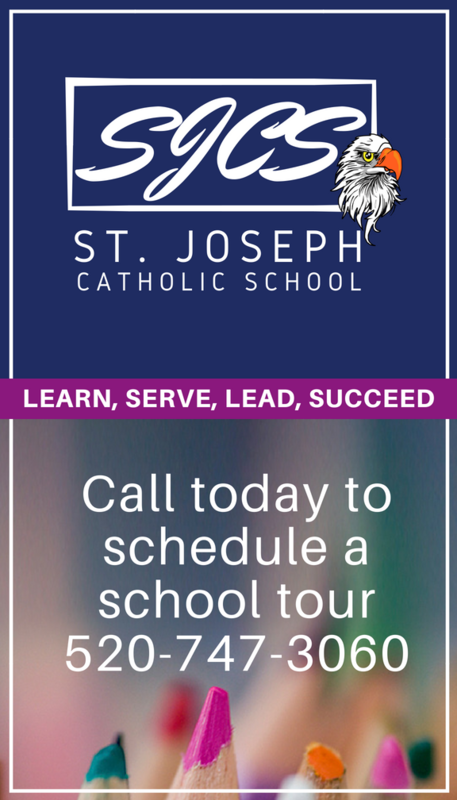 Please call the school office (520-747-3060) to request a tour at St Joseph Catholic School. For a deeper look into our school, here is an updated Information Packet and Tuition Policy. St. Joseph School admits students of any race, color, nationality and/or ethnic origin. In recent years, we are happy to report that we have accepted many applicants from outside the Parish. The following criteria have been established to assist the administration with the application process. Each applicant must successfully complete a grade appropriate screening test. Provide copies of birth certificate, immunization records, Baptismal Certificate (if applicable) and completed emergency contact form. Prior school report cards and records for children entering 1st through 8th grade.